Leases do not include tax, tags, doc fee, destination. Includes $500 College Grab Rebate. 2010 Nissan Murano S Model Stk #108549 does not include $2,999 down payment. 2010 Rogue SL Stk #113465 does not include $2,999 down payment. 2010 Nissan Sentra 2.0S Stk #648506 does not inlcude $2,499 down payment. 2010 Nissan Altima 2.5S Stk #400069 does not include $2,999 down payment. Not valid with any other offer or discount. Pricing Valid until 2/1/10. 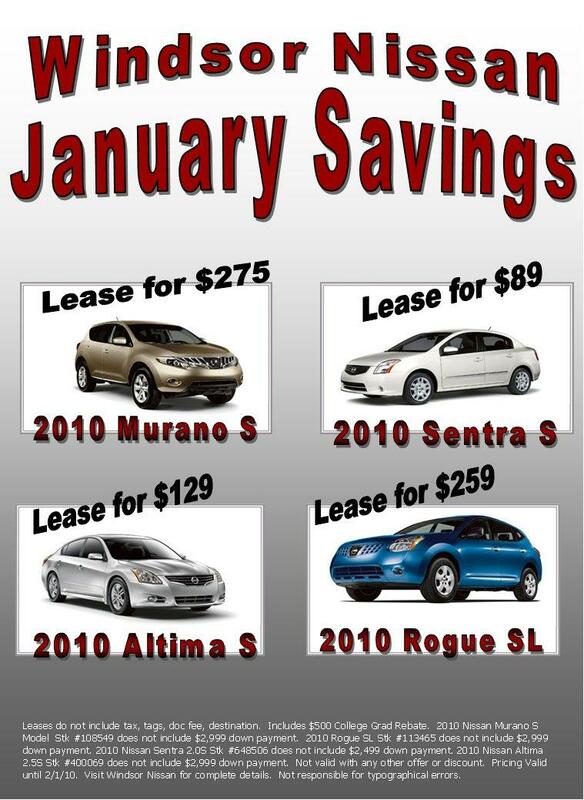 Visit Windsor Nissan for complete details. Not responsible for typographical errors. I imagine that with the recent recall news for Toyota, Nissan sales are picking up..? Nissan sales began to increase during Q4 2009 and recent Toyota recall news will most likely lead to an increase in new Nissan sales. However, the Toyota recall news also brings another black eye to our industry which has been struggling to rebuild itself over the last two years.